Item number 08.491.8812 from the Brooklyn Museum. This information was automatically generated from data provided by Brooklyn Museum. It has been standardized to aid in finding and grouping information within the RRN. Accuracy and meaning should be verified from the Data Source tab. 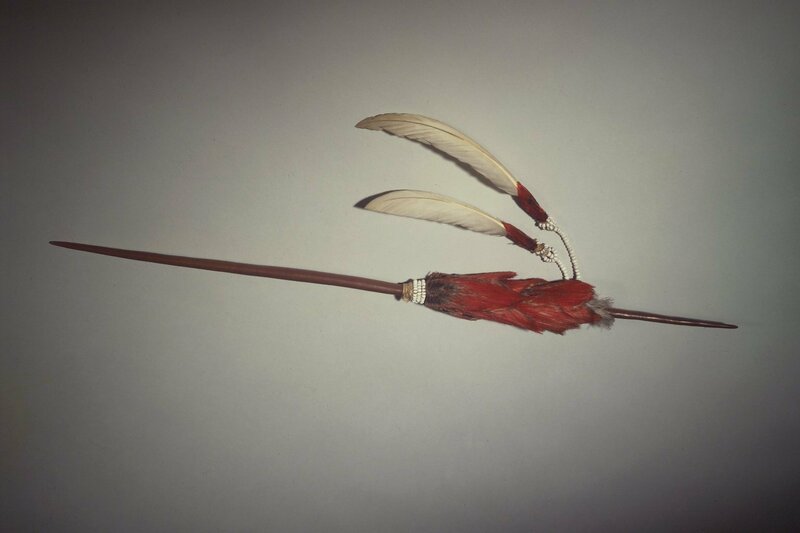 This ceremonial plume would have been worn straight across the back of the head, stuck into a hair net. Curator Culin's informant, George, said that it indicated his rank as captain and it had been a gift to him. The raw materials are responsible for much of the effect of wealth and prestige. The larger piliated woodpecker does not live around Chico; its feathers must be traded in from the mountains. This pin employs sixteen of its scalps- a multiple of four, the sacred number. The manzanita wood for the shaft is especially hard and difficult to carve. This data has been provided to the RRN by the Brooklyn Museum. We've used it to provide the information on the Data tab.